Be the first to share your favorite memory, photo or story of Kingman . This memorial page is dedicated for family, friends and future generations to celebrate the life of their loved one. 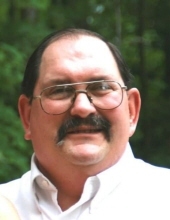 Kingman Wylie, 60, of Lyndeborough, NH, passed away on Tuesday, April 2, 2019, at St. Joseph Hospital, in Nashua, NH. He was born on April 4, 1958, in Nashua, NH, the son of Alva F. Wylie and Stella (Rockwell) Wylie. Kingman was an entertainer, working as a dunk tank clown and a traveling carny for many years. He had worked with George Mitford, Smokey Amusements, and Fiesta Shows and owned Twisted Amusements for 20 years. Kingman also had the honor of being Santa Claus for many years for the VFW in Wilton, NH. At the age of 18, Kingman became a firefighter, serving the towns of Temple, Lyndeborough and Wilton. He retired as a firefighter in 1996. He was a member of the Lyndeborough Artillery and was a part of the Civil War reenactments in Lyndeborough. Kingman will be remembered as a very positive person. His famous saying was, “It has potential”. He recently became an ordained minister. Kingman was a man of many colors. He was a loving man who adored his family and will be missed dearly. Kingman is survived by his sons, Matthew Wylie and his partner, Amanda, of Greenville, NH, Benjamin Wylie and his partner, Elizabeth, of Greenville, NH; his daughter, April Wylie and her fiancé, Tim, of Wilton, NH; his sisters, Kimberly Hullette and her husband, Daniel, of Amherst, NH, and Kaye Tyler and her husband Jim, of Wilton, NH; 19 grandchildren, 3 great-grandchildren, and 2 nephews. Kingman is predeceased by his wife, Leona (Elliott) Wylie, who passed away on September 17, 2002. He was engaged to Dianne Brunt of Lyndeborough, NH, and was soon to be the stepfather of Matthew S. Brunt, of Hillsborough, NH, Debra Brunt, of Peterborough, NH, and Jennifer Caswell and her husband, Bill, of Hillsborough, NH. Family and friends are warmly welcome to calling hours to be held on Monday, April 8, 2019, from 11am-1pm at the Michaud Funeral Home, 32 Maple St, Wilton, NH, 03086, immediately followed by a service. A graveside service will be held at Laurel Hill Cemetery, Abbott Hill Road, Wilton, NH, 03086, at 2:30pm. In lieu of flowers, the family asks for memorial donations to be made to their GoFund Me Page to help with funeral costs,https://www.gofundme.com/help-us-give-kingman-a-send-off-fit-for-a-king. To send flowers or a remembrance gift to the family of Kingman Wylie, please visit our Tribute Store. "Email Address" would like to share the life celebration of Kingman Wylie. Click on the "link" to go to share a favorite memory or leave a condolence message for the family.